Strickland Companies was awarded AOPD Dealer of the Year in Scottsdale, Arizona on February 21st. Strickland holds a number of AOPD contract accounts and services AOPD accounts throughout the country. Accepting the award in Arizona, General Manager Kim Vogel, has been the leader of Strickland’s AOPD efforts. AOPD is the world’s largest distribution network of office supplies and is comprised of 74 dealers in 180 locations in the US, Canada and Australia. Our Commander in Paper, BT Tynes, and his two brothers have joined a group of dedicated and distinguished community leaders who are determined to raise awareness and funds to support the American Cancer Society in saving lives from breast cancer. 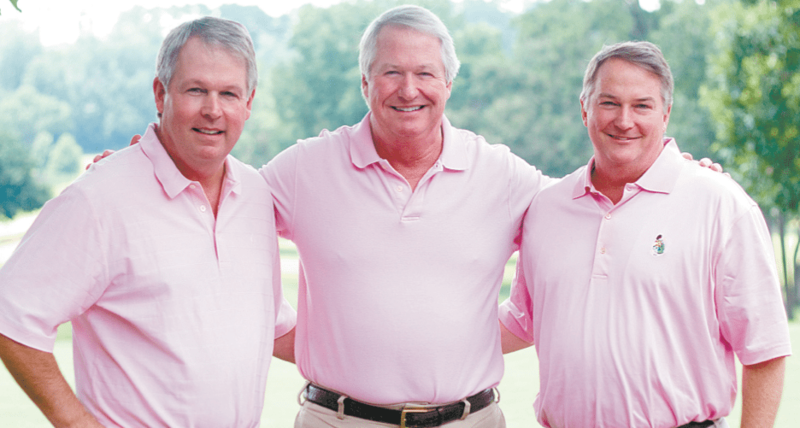 By being candidates of the Real Men Wear Pink campaign here in Birmingham, the Tynes are making a meaningful impact on a cause that touches us all and having some fun while doing it. From left, Ingram, Bayard and Norman Tynes. Cary Wahlheim was able to win her battle against breast cancer with the support of doctors, procedures and her three big brothers. Norman, Bayard and Ingram Tynes are all participants in this year’s Real Men Wear Pink campaign. According to Tynes, Wahlheim’s cancer was caught early enough that after a radical procedure, she hasn’t needed further treatment. But he knows this isn’t always the case and he wants to help change that. That’s why, along with his brothers, Tynes will don a little bit of pink every day in October. “We’ve been buying up pink stuff and T-shirts. We are really trying to spread the word by talking with friends, family and colleagues,” he said. Tynes wants to raise as much money as he can for the American Cancer Society, an organization he trusts and admires. The Real Men Wear Pink campaign is directed at engaging men in the breast cancer fight, but Tynes is invested in fighting many types of cancer, cancers other relatives have battled such as prostate and ovarian cancer. While he said he isn’t one to work just for a trophy, Tynes said he plans to have fun raising money and looks forward to some friendly competition. You can support the Tynes’ Real Men Wear Pink effort by visiting www.realmenbham.com to make a donation or by sharing this blog post with the hashtag #RealMenBham. The Strickland Cares team partnered with Hands on Birmingham and Birmingham City Schools for the annual Back-to-School Beautification this year! We had a great time sprucing up South Hampton Elementary and bringing a little Strickland Sparkle to our community. Executive Interview with Bayard “B.T.” Tynes Jr.
Face-to-face relationships create trust and continue to drive the paper industry. They always have, and they will for the foreseeable future. “Like most merchants, we make our money by who we know, what we know and then we put our relationships and expertise together,” says Bayard “B.T.” Tynes, Jr., president of Strickland Companies in Birmingham, Ala.
After a sales career in the coal mining industry, Tynes joined the company in 1990 as a paper salesperson and learned the business from the ground up, eventually taking over the 88-year-old company from his father-in-law, George Elliott. Today, Strickland boasts six divisions, 35 salespeople and more than 100 employees. To reach that point, the company underwent significant changes. Strickland started in 1928 supplying newsprint to newspapers and Hammermill paper to printers throughout the southeast. Today, its product categories are: printing paper, packaging and machinery, office products, furniture, JanSan and there are more to come. They serve a variety of clients from B2B to government to education. The move toward diversification went hand-in-hand with personal relationships. “We started our diversification with packaging in the ’60s because our printers asked us to help them address the rising need for cut-size papers. They were hand-wrapping reams of cut-sheets, and we found the machinery and films to needed to provide a solution using flexible plastic packaging. Tynes calls it the Strickland “front-door to back-dock” philosophy. “If a customer is using it, we want to sell it to them,” he says. At the same time, Strickland can think long-term instead of quarter-to-quarter. Both his son Beau and daughter Forsyth have joined Strickland, which offers continuity and stability in leadership. “This tells me that our company has a very bright future,” he says. One of the biggest challenges to the industry is effectively addressing our many audiences’ environmental and sustainability concerns. “As an industry, we are beginning to successfully fight the misconception that paper is bad for the environment,” says Tynes. He cites industry efforts to plant and replant trees through sustainable harvest programs, along with clean water and air initiatives. “Recycling paper is what we in America now do as a part of our everyday life, and this is very good for not filling up the landfills and reusing a valuable commodity,” he says. In the marketing world, he predicts that electronic substitution for paper has reached a saturation point. “People realize you need a direct mail component to complement digital marketing. There’s a remarkable difference in how a person comprehends and processes information when they read something on paper rather than on a screen,” he says. While Strickland’s online ordering systems makes it easier for customers to check their account status, pricing and inventory, it hasn’t replaced personal relationships. “Our customers work in a fast, competitive high pressure business. They still want to know who’s taking the order and making sure they are being well taken care of,” says Tynes. At the same time, when Strickland’s customers order online, their transactions tend to be more accurate, and they often order more than they would over the phone. “It’s easier, but it hasn’t replaced the need for person-to-person trust and communication,” says Tynes. © 2017 Strickland Companies, Inc., All Rights Reserved.